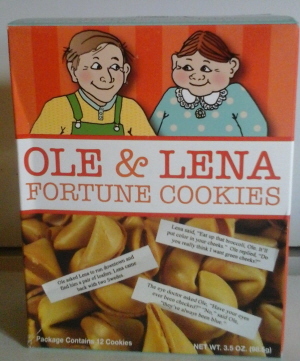 Includes 12 individually Wrapped Fortune cookies with Ole and Lena Jokes. Box is 6.5 in. X 5 in..
Ole asked Lena to run downtown and find him a pair of loafers. Lena come back with to Swedes. Lena said, "Eat up that broccoli, Ole. It'll put color in your cheeks." Ole replied, "Do you really think I want green cheeks?" The eye doctor asked Ole, "Have your eyes ever been checked?" "No," said Ole, "they've always been blue." As Ole and Lena stood by the wishing well, Lena fell in. Ole exclaimed, "Jeepers! I didn't think these things really worked."